1استادیار گروه زراعت و اصلاح نباتات، دانشکده کشاورزی، دانشگاه زنجان. 3دانش آموخته کارشناسی ارشد، گروه زراعت و اصلاح نباتات، دانشکده کشاورزی، دانشگاه زنجان. 4کارشناسی ارشد دانشکده زیست شناسی، دانشگاه تهران. زعفران زراعی علاوه بر اینکه گران‌ترین ادویه جهان است از نظر وجود متابولیت‌های داروئی مهم و متعدد نیز حائز اهمیت ویژه‌ای است. این گیاه تریپلوئید بوده و ایجاد بذر نمی‌کند. به دلیل عقیم بودن، موفقیت‌های کسب‌شده با روش‌های اصلاح سنتی بسیار اندک بوده است. ارائه یک دستورالعمل کالوس‌زائی کارآمد برای این گیاه از دو جهت مورد توجه است: اصلاح این گیاه از طریق مهندسی ژنتیک و تولید متابولیت‌های ثانویه از طریق کشت کالوس است. در این پژوهش ابتدا پنج تیمار مختلف برای ضدعفونی بنه‌ها اعمال شد، سپس ریزنمونه‌های لایه سلولی نازک به ضخامت حدود یک میلی‌متر و ریزنمونه‌های معمولی به ضخامت یک سانتی‌متر از بخش قاعده‌ای و رأسی بنه تهیه شد. 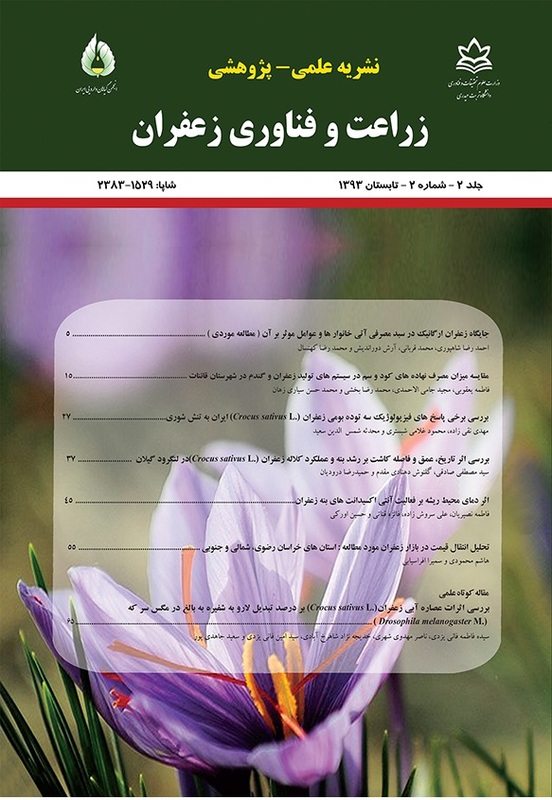 ریزنمونه‌ها در محیط MS با غلظت‌های مختلف BAP،NAA و 2,4-D برای سه ماه در تاریکی در دمای 2± oc20 نگهداری شدند. براساس نتایج، مناسب‌ترین تیمار ضدعفونی استفاده از قارچ‌کش بنومیل و سپس استفاده از هیپوکلریت سدیم دو و نیم درصد می‌باشد. بالاترین میزان زنده‌مانی ریزنمونه‌ها (90 درصد) در این تیمار مشاهده شد و تمامی ریزنمونه‌ها عاری از آلودگی بودند. بالاترین میزان کالوس‌زایی (75 %) با ریزنمونه‌های لایه سلولی نازک بخش قاعده‌ای بنه در محیط حاوی دو میلی‌گرم در لیتر NAA و نیم میلی‌گرم در لیتر BAP به­دست آمد. این میزان کالوس‌زایی در تیمار یک گرم در لیتر 2,4-D از ریزنمونه‌های معمولی بخش قاعده‌ای بنه حاصل شد. با توجه به میزان کالوس‌زایی قابل قبول در ریزنمونه‌های لایه سلولی نازک و نیز مزیت این ریزنمونه‌ها برای انتقال ژن، استفاده از آنها را می­‌توان توصیه کرد. 2Assistant professor, Department of Genetic Engineering, Agricultural Biotechnology Research Institute of Iran (ABRII), Karaj, Agricultural Research, Education and Extension Organization (AREEO), Iran. 3MSC Graduated Student, Department of Agronomy and Plant Breeding, Faculty of Agriculture, University of Zanjan. 4MS.c Faculty of Biology, Tehran University. Saffron (Crocus sativus L.) is the world's most expensive spice. Moreover, it is important since it contains various drug metabolites. Saffron is a triploid (2n=3X=24) and sterile plant and it does not have any viable seeds. Because of the sterility, classical breeding of this plant is limited. Developing an efficient callus induction protocol is studied for two reasons, i.e. molecular breeding and the production of secondary metabolites. In order to provide a suitable callus induction protocol, establishment of corms was considered. Five different treatments were applied to sterilization of corms. Thin cell layer explants with approximately 1 mm thickness and typical explants with approximately 1 cm thickness were prepared from sterilized corms. For callus induction, different explants were planted in MS medium containing different concentration of 2, 4-D, BAP and NAA. Then, they were incubated in dark conditions at 20 ±20C for 3 months. The results showed that the use of Benomyl fungicide, followed by surface sterilization using sodium hypochlorite (2.5 %) was the best sterilization treatment. The highest survival rates of explants (90%) were observed in this treatment and all explants were free of contamination. The highest amount of callus induction (75%) was obtained in MS medium supplemented with 2mg/l NAA and 0/5 mg/l BAP from thin cell layer of basal corm. The same result was observed with 1mg/l 2, 4-D from typical explants of basal corm. The results obtained from this study show that the thin cell layer explants are suitable explants because of the high amount of callus formation and the advantages for gene transfer studies. The results showed that the use of Benomyl fungicide, followed by surface sterilization using sodium hypochlorite (2.5 %) was the best sterilization treatment. The highest survival rates of explants (90%) was observed in this treatment and all explants were free of contamination. The highest amount of callus induction (75%) was obtained in MS medium supplemented with 2mg/l NAA and 0/5 mg/l BAP from thin cell layer of basal corm. The same result was observed with 1mg/l 2,4-D from typical explants of basal corm. Our results showed that the thin cell layer explants are suitable explant because of high amount of callus formation and advantages for gene transfer studies.